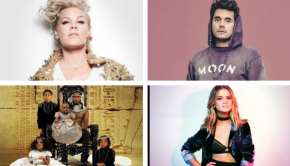 New Songs: P!nk, Offset, Maren Morris, etc. New Songs: Paul McCartney, D’Angelo, etc. New Songs: Elton John, George Strait, ZAYN, etc. New Songs: Neil Diamond, Mark Ronson feat. Miley Cyrus, etc. New Songs: Ariana Grande, Backstreet Boys, etc. New Songs: Camila Cabello, Shawn Mendes, etc. New Songs: Mariah Carey, Maxwell, Halsey, etc. New Songs: Eminem, Muse, Kanye West, etc. New Songs: Janet Jackson, Paul McCartney, etc.